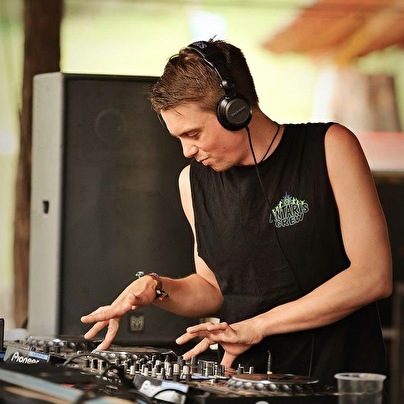 DJ Goa Jonas was raised in Goa from the age of 5, 1989 onwards, thus got in contact with goa trance at a very young age, he used to love to watch the DJs playing, when he was 12 at the same time as one of his best Friends Leo K. Wafayar he Started DJ'ing, in Goa end of 95 beginning 96, Goa Jonas was taught by Danish DJ Christian, at first playing with D.A.T. Tapes of Christian on a party in North Anjuna and Shorebar then slowly building up an own D.A.T. Tape collection which he then got to use first time in 97 at one of the most famous party Locations in Goa Disco Valley, just after Sunrise at the age of 13. Hill Top, South Anjuna Beach, Bamboo Forest, Shorebar, 9bar, Paradiso, and so many more places....) aswell as Boom Festival 98 in Portugal, Momra Encentro in Spain. Beginning of 1999, after being out of India for the first time in over 8 years, for only 3 weeks playing on the Boom 98 and the Momra Encentro, he left Goa to Visit his Birthplace Germany, which also Brought the change from D.A.T. Tapes To CDs, Where he played played for the first time on CD at the Antaris Festival 99. Was in Ibiza Summer 99 where he Produced his First Track with Riktam from GMS which was realleased end of 99 on T.I.P. recs. Came back to Goa For the Millenium where he played the sunrise set on 1.1.2000, in the years following he was in school in germany and Learning a Job... Got back to Goa for the Millenium and Season 03-04 with allot of Playing, but otherwise in germany with only 2-3 sets a year but since end off 2009 he is back in Goa every year and Playing on its dance floors again aswell as the Antaris Project 2007, 2010 also 2011 and 2012 and Sol Festival 2011.